Over the last week or so I’ve been making a list of my top 12 influences, visual artists and their work that influence and inspire me. 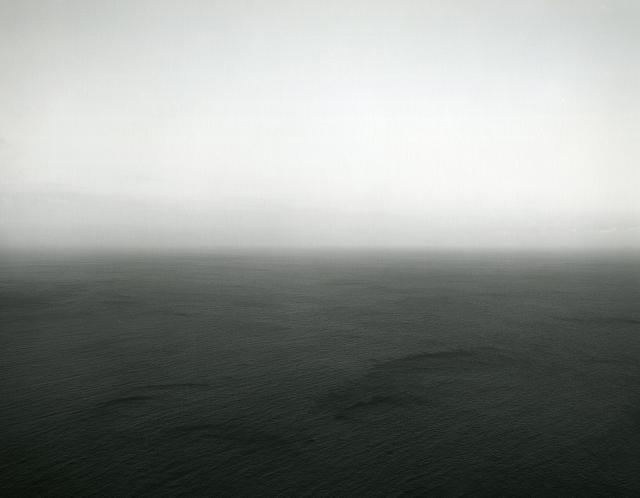 Consistently over the years Hiroshi Sugimoto has made this list. Born in Japan, Sugimoto moved to the US to study in the mid-70’s eventually settling in New York. While he’s returned to a number of subjects repeatedly over the years, including ‘American Theatres’ in which he photographs old movie theaters and drive ins using long exposures in an attempt to show time in his photographs; ‘Dioramas’ which are beautifully executed photographs of exhibitions in natural history museums and more recently of wax-work figures; ‘Architecture’ in which he photographs structures slightly out of focus which gives a sense of the form that the architect had in mind without you getting lost in the details and my personal favorite ‘Seascapes’. His seascapes, such as the one above, give a real sense of the vastness of the ocean that particularly appeals to me. Check out the documentary below for more about Sugimoto’s life and work. I was prompted to look at Arnold Newman’s photographs this week. Arnold Newman is widely thought of as the ‘Father of Environmental Potraiture’, contributing photographs to all major publications from Life to Scientific American and everything in between. He got his start in portraiture by taking photographs of artists. At the time the artists he photographed were neither rich nor famous and Newman himself was an unknown, honing his craft. His approach of using the camera to explore the world of the person he’s photographing, to show something of their character by placing them in their surroundings began with his work with the artists. He has said that a good portrait must first be a good photograph. For me the most iconic of his photographs is that of Stravinsky shown above. 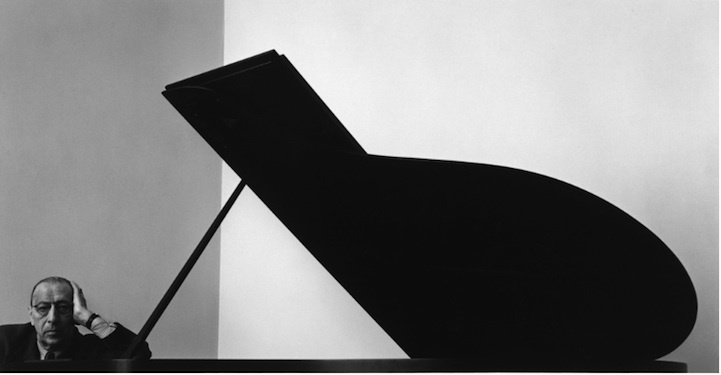 Stravinsky propping his head on his arm neatly echoes the way that the lid of the piano is propped open. It is a strongly graphic, minimal image that appeals to me greatly. Looking at many of his other portraits you start to see how he has stripped away all but the essentials that he needs to tell the story of the artist, celebrity or statesman. An exhibition of his work ‘Arnold Newman – Masterclass’ is now showing at the Contemporary Jewish Museum in San Fransisco. If you’re not able to Make it to the show you can watch a gallery tour given by the shows curator William Ewing here. There’s also a catalog to accompany the exhibition that can be had here. Finally check out the interview with Newman below for insights into how he worked and a behind the scenes look at how some of his most famous images were made. I’ve been on the road for a couple of days and will be traveling for a few more. I’ve been using my iPhone to make ‘sketches’, to try out ideas and stretch a little. I am however also drawn to the familiar as you can see from the above image. As I was setting up my tripod for this shot this summer as I collapsed, de-telescoped, closed or whatever you call it, one of the legs the rubber foot shot off sending me scrambling to find it. Luckily I did! The glue had finally given up on the Gitzo 1325 legs of my tripod. Not bad after taking a beating for 8 years. I got a two part adhesive and glued it back in place and my tripod problems were over. Or at least I thought my tripod problems were over. When I was using the tripod this week one i found that one of the legs was impossible to fully extend. Years of neglect had finally come home to roost. 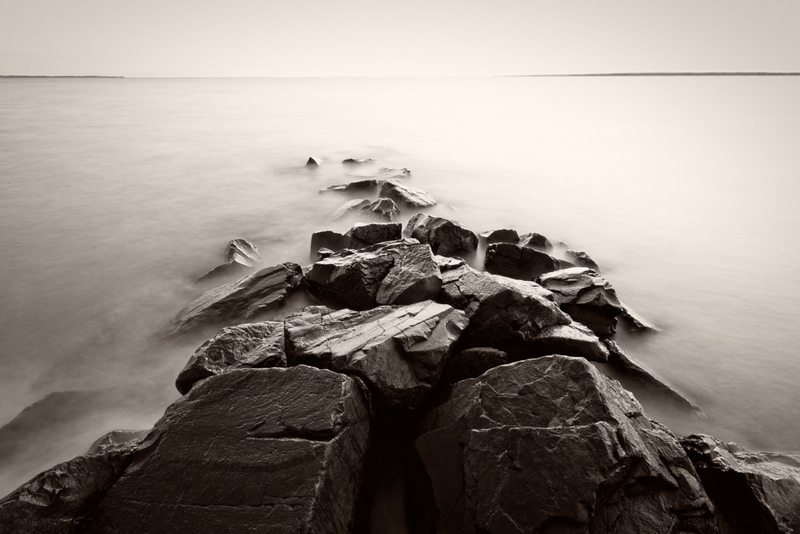 Photographing in and around the ocean means that your gear takes a pounding. Ideally you would rinse the salt water off your gear with fresh water. There are obvious problems doing that with cameras and lenses but you can and should do some clean up of your gear with a soft damp cloth after you’ve been out. I do this as needed after every shoot but I’ve never properly cleaned my tripod. This has largely been out of fear of getting the tripod to pieces and not being able to get it back together again. I actually found that taking the tripod to pieces was much easier than I’d expected. On the old Gitzo that I have it’s simply a matter of unscrewing the leg lock the whole way and then pulling on the leg. The one that was stuck needed me to stand on the head of the tripod and then yank hard on the leg. Eventually it yielded to force! While the tripod was in pieces I took the opportunity to clean up the threads both on the leg and on the screw lock. The leg locks had been making awful grinding noises for years, presumably from sand and salt getting in there. This was easy enough to do with a rag for the legs and a toothbrush to get into the locks. As an aside I had always been taught to extend the tripod fattest section first, which of course meant that the lower section lock ended up under water the first time I used the tripod at the beach. While this advice is generally sound I typically have the lower section extended the width of my hand – about 4 inches – and then when working at the beach this is the first section that gets extended. It was quite an educational process and easy enough that I could have been doing regularly all along!